It's almost Halloween and I love our Halloween themed bento boxes. But, I also have a scary amount of special tools which makes them quite easy to create. Gogurt challenged me to create a Halloween themed bento for them, and I added a spin to keep it easier, in case you don't have a very very large cabinet full of bento tools at your disposal. 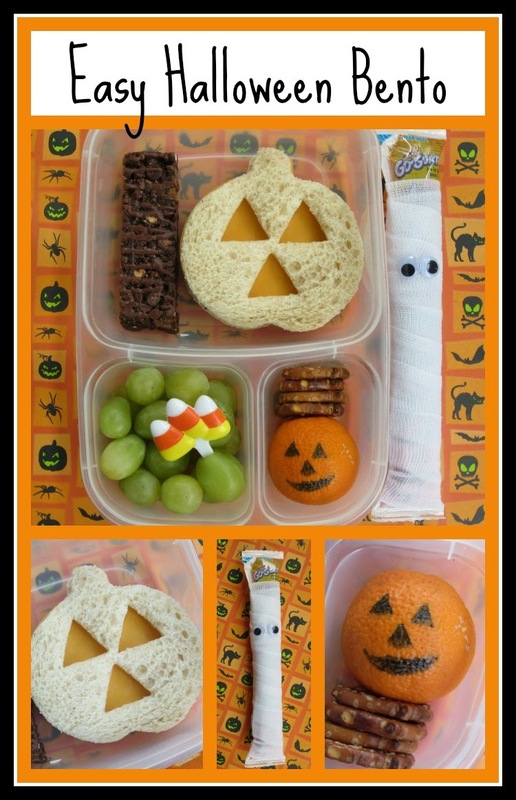 So what's in our Halloween bento today? 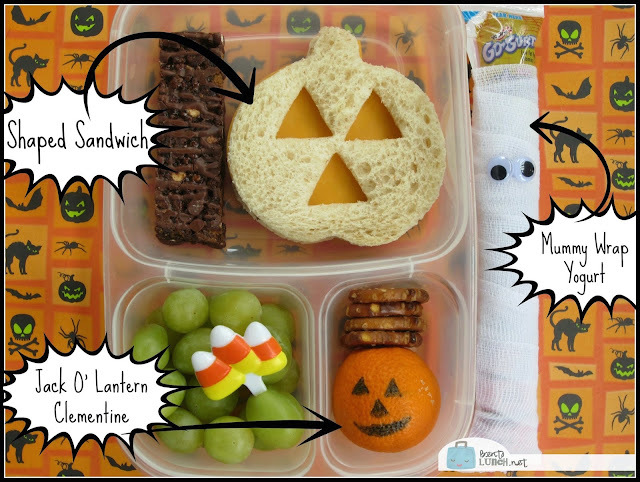 The quick summary is a ham & cheese sandwich, a Count Chocula bar (from another blog project, and yum! ), grapes, a clementine, a few pretzels and a Gogurt, packed in our Easy Lunchboxes. But we also spooked it up. We started with shaping our sandwich into a pumpkin. If you have any Halloween cookie cutters, this is easy to do. Just make your sandwich and cut it out. If you don't have any specific cutters, it's fairly easy to make a pumpkin with and kind of round cutter, then just use your knife to cut a few triangles for the face. Put your cheese on top of the meat and the orange peeks through. Our clementine is also decorated for Halloween. 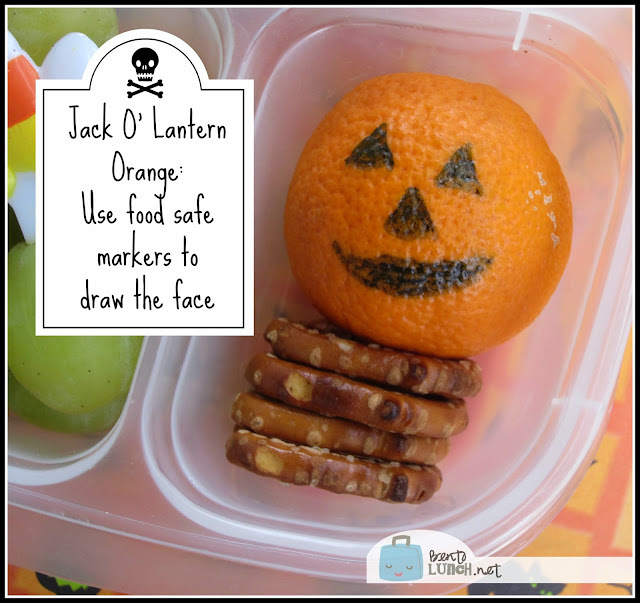 Using food safe markers, you can draw a face right onto the peel. I also add a small cut on the backside to make peeling it a bit easier for the kids. You don't need much, just a starter piece. The Gogurt mummy might be one of my new favorite things. We purchased a roll of gauze at the dollar store, then cut a piece just big enough to wrap the yogurt tube (leave room for the top to be peeled). I used a dot of hot glue on the bag to hold the wrapping on, then two more dots to attach the eyes. 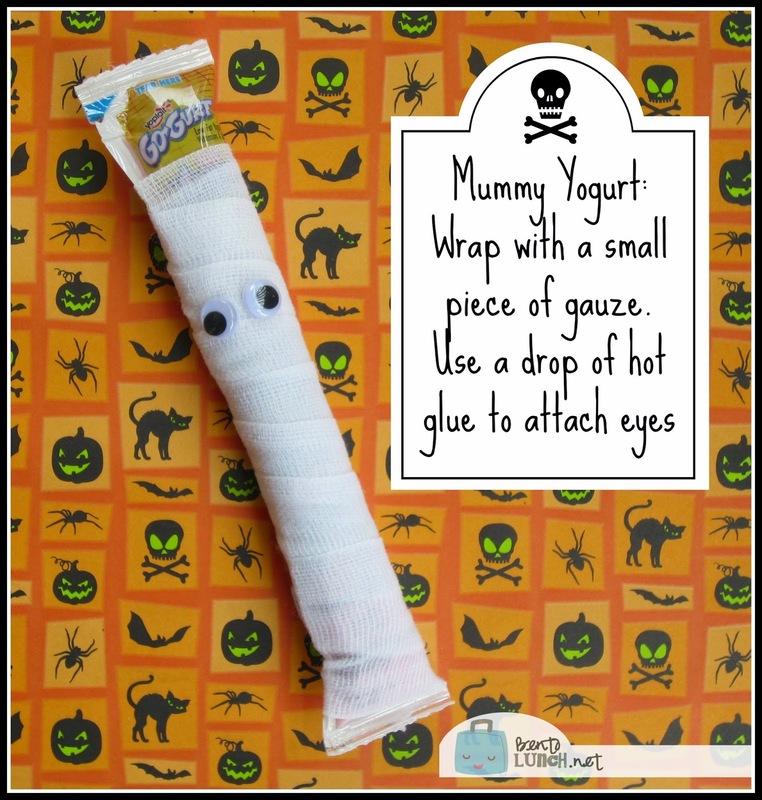 The Gogurt mummies or the jack o' lantern clementines might be really cute for a class party or treat too. They're still sealed/labeled and they probably fit in with the mostly-healthy theme a lot of schools request! What kinds of fun things do you do for Halloween with your kids? I'm also making mummy dogs this week (sausages wrapped in crescent roll strings and baked). 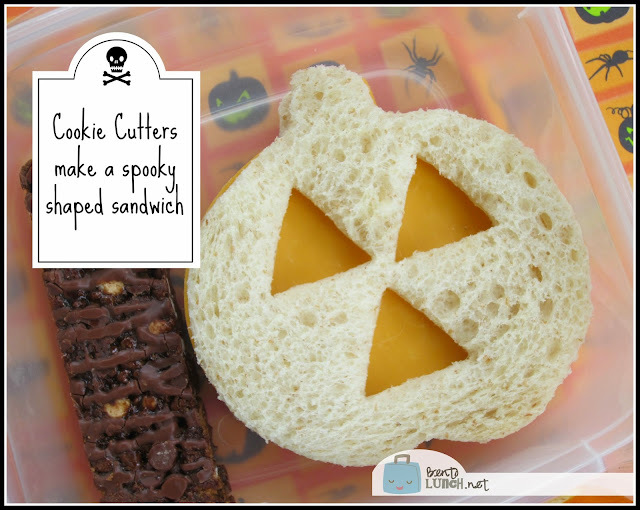 For lots more Halloween ideas, check out my Halloween tag, especially for lunch inspiration! 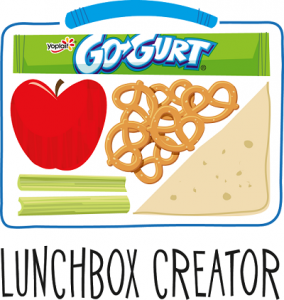 Disclosure: I am a Gogurt Lunchbox Blogger. This lunchbox was created as part of my relationship with Gogurt and I was compensated for my time and design. All opinions expressed are my own.